'DIY Wills' - What can go wrong? ‘DIY Wills’ – What can go wrong? The risk of using a DIY Will kit, typically bought online or from a newsagent, was highlighted in the case of a client I saw recently, whose spouse had just passed away. They had decided to purchase the kit and prepare very simple Wills, leaving everything to each other and then to their children. How could that go wrong I hear you ask? Unfortunately the Wills they drafted at home ended up being invalid. There are so many ways for a poorly drafted Will to cause problems. In this case, our client and her husband made a few mistakes. 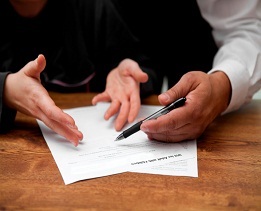 They witnessed each other’s signature on their Wills – The law immediately invalidates any inheritance made in your Will to a person who witnessed your signature. Our client, who was meant to receive everything under her husband’s Will, was entitled to nothing. This meant that everything would go to their three children because the Wills stated that, if their spouse couldn’t inherit, then ‘33% went to each child’. By these words, they had failed to account for 1% of their estate. This meant that we had to make a separate and expensive application to the Court in relation to that missing 1%. Finally, each Will appointed their spouse and another relative as co-executors. Although they thought this was a good idea at the time, there was no need for it as it added a new layer of complication and, therefore, more expense incurred to obtain the resignation of the co-executor. Luckily our client was able, with our help, to rectify the problems, but she had to spend a significant amount on various Court applications to achieve the outcome that she and her husband wanted – an outcome that could easily have been achieved, at much lower cost, with well-drafted Wills. This highlights the benefits of ensuring that your Wills, Powers of Attorney and Enduring Guardianship are prepared by your lawyer. If you choose to ‘DIY’, then the potential for failing to achieve the outcome you want, and for incurring large additional costs, is a very high price to pay for taking the ‘inexpensive’ option.